A fantastic and striking range of cricket batting gloves from TON for 2018. TON is the brand of the world renowned Sareen Sports Industries. The very recognisable TON logo can be seen on the edges of many of the world's best international cricketers. The name has become synonymous with superior quality soft leather goods. 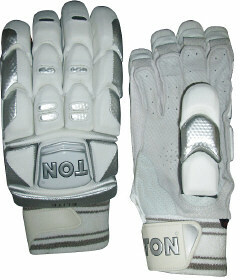 This Test quality batting glove is used by International Cricketers all over the world. - Super soft pittard leather palm for a very comfortable fit. - Pre-shaped plastozote fingers with front 2 being strengthened with Fibreglass. - Reinforced padded palm panel for comfort and control.